We made the trip into Philly territory last weekend and being so close to the city gave us a craving for two of our favorite city foods, soft pretzels and cheese steaks. The fact that our alma mater was playing ODU for a spot in the CAA tournament was just one more reason to make these classics at home and watch the game. DaddyO has made this recipe more than a couple times. This was his first attempt a year ago. They were good then but seemed even better this time. Here is the recipe that produces a chewy tasty snack every time. The pretzels are just as delicious with a little mustard squeezed on top, but we thought we'd take it to the next level and make a little cheese dip to go along with them while we watched the game. The recipe (from Epicurious) is so simple you'll be making this for all sorts of other dishes! Rub the bottom and side of a heavy saucepan with the cut garlic. Place the garlic clove in the pan, add the beer, and bring to a boil over high heat. Meanwhile, place the cheese and cornstarch in a bowl and toss to mix. Sprinkle the cheese into the boiling beer, stirring it with a wooden spoon. Let the sauce come back to a boil; it will thicken. Reduce the heat slightly, stir in the mustard, and season the sauce with salt and pepper to taste. Let the sauce simmer gently until smooth and rich-tasting, 3 to 5 minutes, stirring steadily with the wooden spoon. The purist can fish out and discard the garlic clove; otherwise, one lucky person will get to eat it. 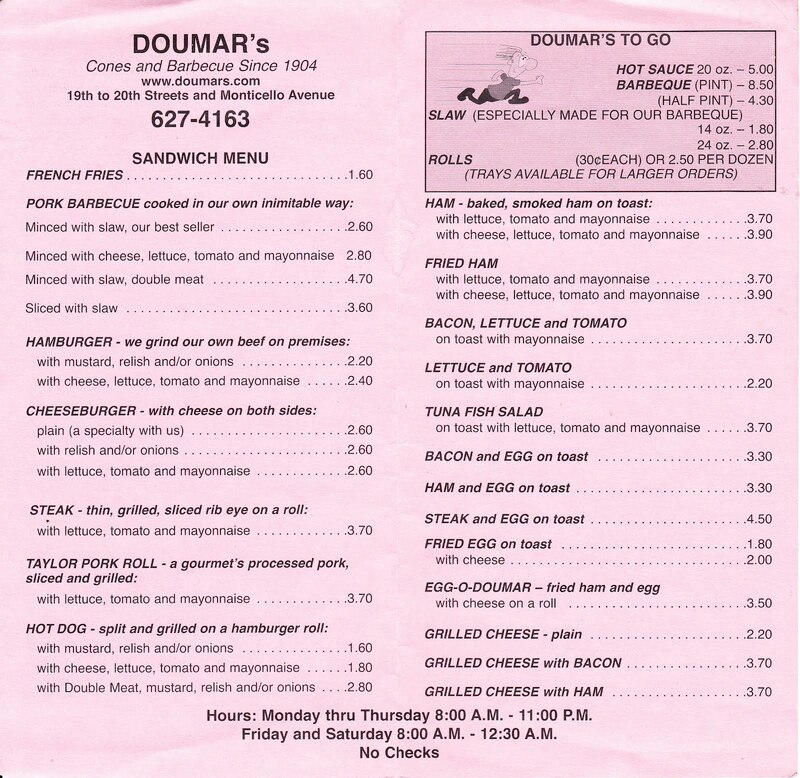 As many know, there is a standing rivalry between cheese steak vendors in Philly. Pat's and Gino's are most famous but my personal favorite is Jim's on South Street. Instead of trekking into the city and deciding on a place we all would like, DaddyO decided to try his hand at this civic icon for the first time and, although a little nervous he'd make a silly imitation, we all agreed his cheese steak rivaled those bought in the city. The importance of buying true Amoroso's buns cannot be stressed enough here. They are what make a cheese steak a cheese steak! Remove the beef from the refrigerator 1 hour before cooking. Preheat a grill pan over high heat. Lightly pound the chain with a smooth meat mallet until it is even thickness throughout. Toss the meat with 1 teaspoon olive oil and season with salt and pepper. Once the grill pan is hot, place the chain on the pan and cook on both sides until cooked through, approximately 3 to 4 minutes per side. If necessary, cut the chain in half or thirds to fit on the pan. Remove the chain from the grill and wrap in aluminum foil. Allow to rest while the onions are cooking. Add remaining teaspoon of oil to grill pan and saute the onions on the grill until they are tender and beginning to brown, approximately 7 to 10 minutes. Slice the beef into small strips and divide evenly among the hoagie rolls. Pour any juice from the meat onto the hoagie as well. Top the meat with the cheese, followed by the onions. Wrap the sandwiches in aluminum foil for 10 minutes and serve. but where's the cheese whiz? The Drexel Dragons won the game as we noshed on our Philly favorites. Now we just have to figure out what to make for the next game! We loaded up the car and headed north to spend a nice long weekend in PA. Besides wanting to spend time with family before DaddyO does his long cruise, we also were anxious to visit our IG who has been staying with grandparents while we're at the vacation rental and I got to have my first doctor's appointment with the group that will be doing my delivery. The highlight for EJ was all the special time spent with grandparents and cousins. From riding scooters, to playing with dollhouses, she was constantly playing and interacting. We were reminded once again how wonderful it is to have family around. Thanks to family, DaddyO and I got to have a little date night of our own with his brother and sister-in-law. It was nice going out without running after a two year old. It doesn't happen very often! Sunday morning was a drive into the city for a fabulous church service at Tenth Pres, lunch at Lovash, and coffee at Volo. A few parks and a little shopping were mixed in as well. We would sure love to move back to the city! It was a wonderful weekend home with family! We had some beautiful 60 degree weather this week so EJ and I headed to Mt. Trashmore to make the most of a warm day. The name isn't the most appealing but it is definitely the playground of choice here in the VA beach area. A mountain of trash was converted into a climbing hill beside a lake and a beautiful playground was constructed at the foot of it. There are activities the whole family can enjoy at the park but EJ doesn't usually want to leave the slides. As much as I would love to be preparing for a garden right now, Sprout Robot definitely got me in the mood , the fact that sand not soil surrounds us, our patio is the size of a postage stamp, and we wouldn't be around to enjoy the fruits or our labor anyway, I have accepted the fact that potted flowers are the only thing growing right now in our condo. DaddyO picked up a pot of daffodils for EJ a few days ago after he realized what an impact buying flowers for me had made. We can't pass the floral section at Trader Joe's without her reminding me of the flowers he had given me. So now, part of our breakfast ritual is reading Planting a Rainbow together and then watering her delicate blooms. She loves finding her favorite colored flowers in the book, they happen to be yellow, and then comparing them to her daffodils. Although chocolate was probably on the top of his list, DaddyO got a special valentine from EJ this year that would last a little longer and be a little healthier. She made him a a frame with her hand prints and photo that will go with him on the ship. It was a fun and easy project for us to do together. When I saw the wood frame at Michaels for $1 the idea immediately came to mind. We picked up a couple bottles of acrylic paint (black, red, pink) a foam paint brush, and a white paint marker, and were set to start! The only other thing needed is your little ones hands. EJ was happy to share them! First I painted the frame black and then let EJ have fun with her hands. She loved painting them and seeing the print they left. First the right, then the left. We finished the frame off with a few phrases around the heart, inserted EJ's Valentine picture, and the frame was ready for EJ to give DaddyO on her Valentine date with him. With Valentines Day around the corner I sewed an stitched one more heartsie outfit for her to celebrate the holiday in. The applique started off as just hearts but with a simple stitch turned into a bunch of balloons. The shirt matches the skirt I made EJ for Christmas using these instructions. One of my favorite things to sew right now! So simple and so sweet. DaddyO left for a cruise on his new ship a few days after we arrived in Norfolk. It was a mini cruise, a workup to the long deployment, but time away from the family nonetheless. So when the morning of his return finally arrived there was a lot of excitement. I have been counting down the days till his return with EJ and I realized how much she understood when she asked the night before if DaddyO would be home that night. She was just a day off! I got word early morning that DaddyO's ship was approaching the coastline and I should be able to see it soon. I attached my zoom to the camera and started watching. It was a little before breakfast that we saw the silhouette of the carrier on the horizon. 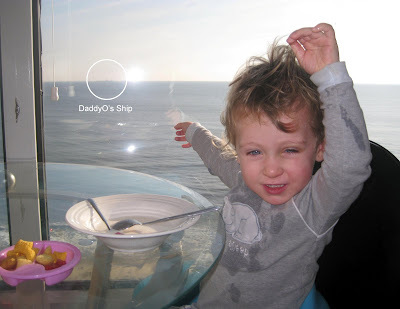 EJ and I poured our cereal and enjoyed watching the ship sail across our windows. We headed to the pier to meet him. It was my first homecoming from a ship (his previous ones were at a hanger after he flew his helicopter back) so it was interesting seeing all the families lining up to welcome one of the three thousand service members off the ship. EJ watched and watched all the blue and green uniforms walk by trying to spot her DaddyO. And then there he was, a head above the crowd, walking right towards her! She gave him a big kiss and a hug and wouldn't let him leave her sight the rest of the day. We spent the day doing some of her favorite things...eating sushi, going to the playground, and cuddling up with DaddyO and reading a book. 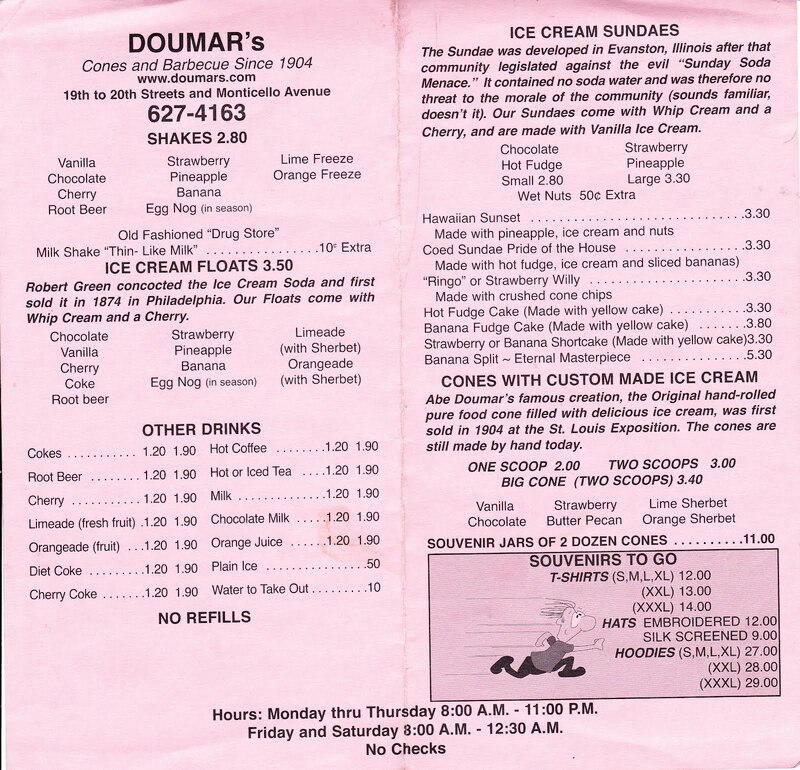 We were quite excited when we were first introduced to Doumar's. 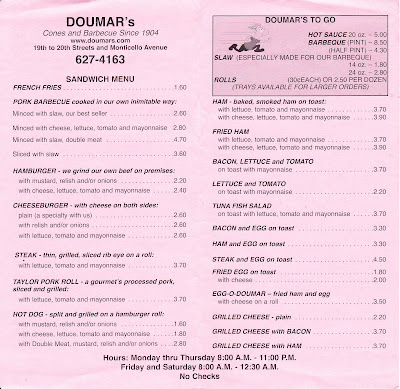 Located just around the corner from the Norfolk Zoo, it has become a tradition to stop here for some burgers in the car. All Natural Fruit Juice "Jello"
Fruit juice "jello" is one of those snacks I feel good about giving EJ whenever she wants to make it. She is not a big juice drinker, prefers water over anything, but this is one of her favorite snacks. 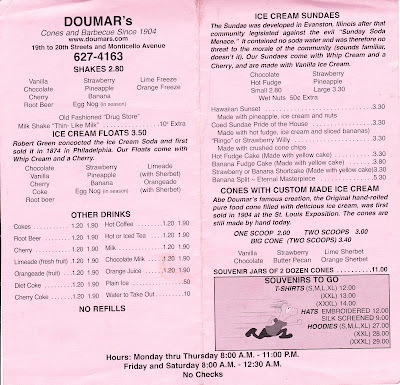 Since the only two ingredients required are juice (Northland is my juice of choice) and gelatine, you know there is no added colors or sugars. The juice provides the perfect amount of sweetness! EJ is always willing to help me make her jello. and pours the juice into the pan. The most difficult part of the whole process is waiting the couple hours it takes for the juice to set. She likes to open the refrigerator and check on the bright red glasses chilling inside. Once the jello is ready though, all the waiting is worth it! 1. Sprinkle gelatin over cold juice in measuring cup; let stand one minute. Add cold juice to the hot juice in pan and stir until gelatin completely dissovles, about 5 minutes. 2. Pour into desired cups or pans. 3. Refrigerate until firm, about 3 hours. The dress was very simple and can be made in under 30 minutes. I felted a pink 100% wool sweater I found for $1 at the thrift shop and placed one of EJ's jumper dresses over it. I cut the edges off following the pattern of the dress but left the neckline intact. I then sewed the side seams together and did a zigzag stitch on the sleeves. The dress was sewn! To add a little extra valentine fun I appliqued hearts to the front and back of the dress using some scrap red fabric in my stash. The result was an extra soft sweater dress that brings a little more love to the upcoming holiday!